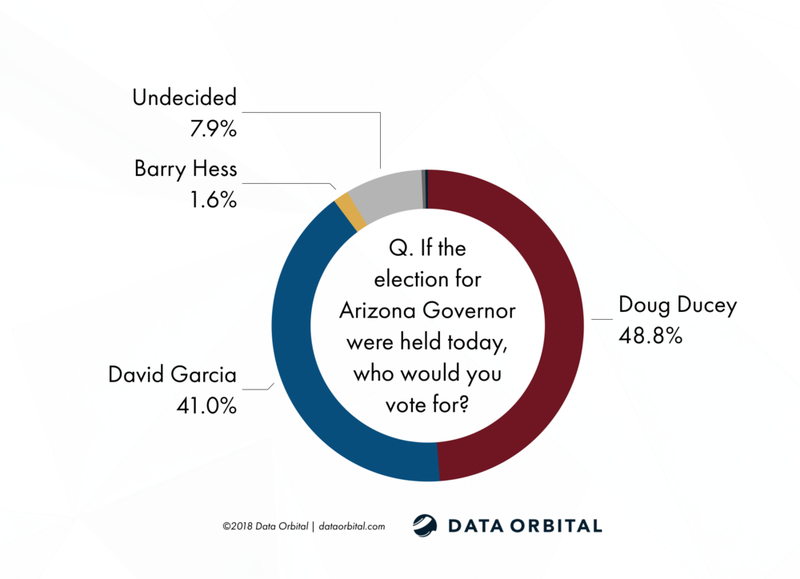 Data Orbital’s ballot test for the Arizona Gubernatorial Race, between incumbent Republican Governor Doug Ducey and Democrat David Garcia, shows Ducey with just under an 8% lead. With only 7.9% of surveyed voters being undecided, there is little room for major movement leading up to election day. “These numbers indicate that even with high enthusiasm from Democrats, Governor Ducey still holds a comfortable lead,” says George Khalaf, President of Data Orbital. Early ballots will be mailed out on October 10. The survey was of likely Arizona General Election voters and was conducted from September 4th to the 6th. Looking at the view of President Trump the survey shows President Trump underwater by 6.5 percentage points, consistent with past survey results prior to the Arizona primary election. This poll of 550 likely General Election voters was conducted through a live survey that collected 70% of the results from landlines and 30% from cell phones. It has a margin of error at plus or minus 4.18%, with a 95% confidence interval. Respondents were weighted on a number of different demographic figures based off historical Arizona general election turnout. The poll was conducted on September 4-6. All non-released questions prior to questions released would not reasonably be expected to influence responses to all released questions. The questions released are verbatim from the survey provided to respondents. Toplines and demographic data can be found here. Crosstabs for this survey can be found here. Thanks. By the way PPP is a Democrat polling firm, was hired by Garcia and may have only polled registered voters and not likely ones. The latter is a big yellow flag. But time will tell, although I do not believe Garcia will fare well in the ad and mailer battles. Well, a 538 grade of B over 411 polls seems more historically reliable than a 538 grade of B+ over 7 polls given all pollsters are subject to the same analysis. The Democrats have a hard climb, to be sure, but it is not outside the realm of possibility. Republican incumbent Doug Ducey is neck-and-neck with Democratic challenger David Garcia in the race for governor, according to a post-primary poll of Arizona voters. The poll — conducted by North Carolina-based Public Policy Polling on behalf of Garcia’s campaign — found that 44 percent of voters supported Ducey, 43 percent backed Garcia and 13 percent remained undecided, the poll found. Of the 544 registered Arizona voters interviewed on Aug. 30 and 31, 40 percent identified as Republicans, 36 percent identified as Democrats and 24 percent said they were not a member of either party. Ninety-two percent of respondents said they’d voted in the 2016 presidential election. Among conservatives, Ducey retained strong support, with 78 percent of Republican voters backing him. Overall, Ducey’s approval rating was 42 percent, with 45 percent unimpressed with his performance. Public Policy Polling has a B grade from 538 based on 411 polls analyzed. And Data Orbital received an impressive B+ rating from FiveThirtyEight’s poll ratings. Based on an analysis of 7 polls but what is so awesome is that you are looking stuff up and using a credible source. And how are your never end voter suppression efforts going on behalf of Ducey this week?